You walk into the tackle store and order three dozen live shrimp, but have you ever considered where those shrimp came from or what went into keeping them alive? Nearly all of the shrimp that are sold in Pensacola and other nearby towns are transported from other areas, often as far away as central Florida. Believe it or not just about every day during the busy season trucks travel from Perry and Port St. Joe, Florida with loads of shrimp for tackle stores along the Florida Panhandle and Coastal Alabama. The boats pull for shrimp in the evenings and throughout the night making short drags in order to keep them alive. 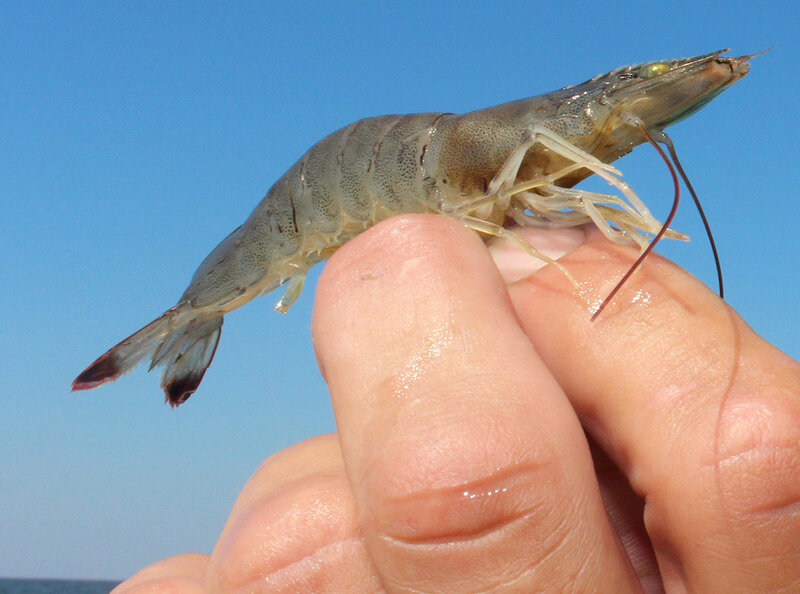 If the boat pulls for too long, it will kill the shrimp and that’s one of the reasons that catching live shrimp in Pensacola Bay is hard to do. Most live shrimp that are sold along the Gulf Coast are caught in fairly shallow water in areas where there’s a large concentration of shrimp. Shrimpers in Pensacola typically have to pull for longer periods of time to get a decent harvest. A lot of live shrimp are caught and sold in Alabama, Mississippi, and Louisiana as well, but there aren’t any wholesale operations who regularly deliver shrimp into Florida from the west. Of course there are regulations in place and licenses required regarding traveling live shrimp, especially when going from one state to another with them. Keeping them alive from the point where the net is pull aboard the boat until you walk out of the tackle store door is to say the least a daunting task. Considering that most tackle stores are located inland where there is no source of saltwater makes it even more challenging. You’ll find that the majority of stores make their water using Instant Ocean or another brand of aquarium salt. Water temperature is also a big part of keeping them alive when trying to hold a large amount in a small tank. That’s why you’ll notice that the water you leave the tackle store with will usually be pretty cold. By using a chiller and making the saltwater you get to control two of the most important variables when it comes to keeping shrimp alive in a tank for an extended period of time. After paying somewhere in the ballpark of $3 to $5 per dozen and the success of your fishing trip often hinging on your shrimp being alive you definitely don’t want them to die. There’s a few things you can do to increase your chances of having healthy shrimp when you arrive at your fishing hole. It’s always a good idea to have some sort of air pump, even if you’re only transporting them a short distance to the boat ramp or nearby marina. These pumps start at about $10 and the inexpensive ones will get the job done, but don’t expect for them to last very long. If you’re going to fish off of one of the local bridges or piers I would suggest using a bucket and air pump over lowering your bait bucket down to the water with a rope. Your shrimp will stay a live a lot longer because they aren’t getting beat to death bringing the bucket up and down. Another thing to always keep in mind is the cool water temps that tackle stores use to hold onto these large quantities of shrimp. If it’s a hundred degrees outside and you take your shrimp from sixty-five-degree water and dump them into eight five-degree water, they will go through a period of shock. A lot of times after a few minutes most of them will recover, but you can avoid this happening by just transitioning them into the warmer water. All you have to do is dump some warm water in the bucket with the cold and let them sit for a few minutes. If you don’t have a live well on your boat or kayak or are fishing from a pier be sure to change your water out every so often. The quickest way to kill a bucket full of shrimp is to let the water get to warm. So next time you walk out of the tackle store with a bucket full of live shrimp take a second to think about the time and effort that went into catching and keeping those shrimp alive.